The new Party Poker App Android has been unleashed offering players a mobile version of PartyPoker for Android mobiles and tablets. Play Texas Holdem Poker cash games or the new FastForward Poker on your device. The Party Poker App supports Wi-Fi and 3G networks, so you can play poker anywhere, anytime! Real-money and play-money game available. Play Poker on Wi-Fi (fastest) or 3G networks. 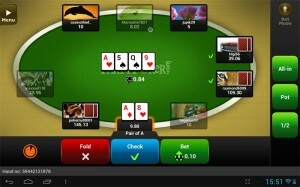 The Party Poker App supports Android devices using version 2.1 and higher. Download PartyPoker App for Free – Click the link while browsing with your Android mobile or tablet. Enable non-Market apps click on “Settings” then “Applications” and select “Unknown sources. Log in to the Party Poker App with your username and password. New players can only sign-up for a play-money account from the Party Poker App, to play real money poker games players must download the PC version of PartyPoker and create a real money account. The Party Poker App supports deposit and cashout options within the app. When launching the app players must choose from “Real Money”, “FastForward” or “Play Money”. The PartyPoker App features a quick seating lobby where players can select their game type and the stakes they wish to play. Choose the amount you wish to bring to the table and you will be seated for the next hand. FastForward Poker is only available for real money play on the Party Poker App. Play the fastest online poker game on Android. Players can view their past hand history directly from the Party Poker App, click on “Menu” then “Info” while seated at the mobile poker table.